Hello Dealsnloot Readers,Get free 100 MB 3G Data on Sign up. My Vodafone app is a one-stop destination for managing your Vodafone account, bill payments, mobile recharges, buying bonus cards and checking mobile usage. It is offering free 100 MB 3G Data just on Downloading this app Vodafone user and haven’t installed the “My Vodafone App” yet? 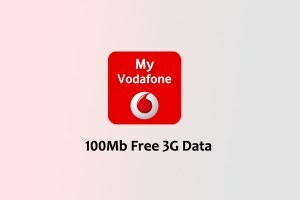 If yes, you can make use of the Vodafone Free 3G Internet Data offer and get 100 MB 3G Data just for installing and signing up with the “My Vodafone App”.Grab This Loot Deal and Get 100 MB Free 3G Data By Vodafone. 1) Firstly download and install My Vodafone App from here. 3) Enter all the required details and Register for new account. 4) Do the Mobile verification with the OTP you received on your phone. 5) That’s it. You will soon receive 100MB 3G data within 72 hours. Enjoy. No data charges for the app usage while using Vodafone mobile internet connection. Data charges are applicable for usage outside India and external app touch points.